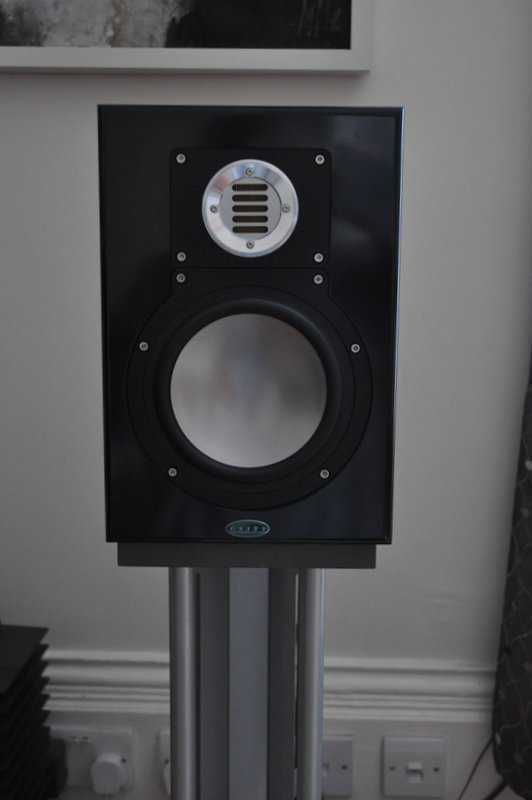 I'm continuing my exploration of active monitor loudspeakers, ever since I found out that these can sound great and often represent excellent value compared to an audiophile amp and passive speakers. It is really remarkable to see how many brands are out there and how different many of them are to hifi loudspeakers. Ignoring all of this, as most of us do, is a serious mistake and one of the best examples of this are the speakers under review here, the Unity Audio 'the Rock hifi'. But I'm getting ahead of myself. Let's start with the basics. The Rocks are a small, sealed, active, two-way system, intended for mixing and mastering use in a professional environment. The ‘hifi’ version reviewed here has a nicer exterior, with a better finish, and features some more ‘audiophile’ components inside. They are meant to be used in the near field but, as is often the case, this doesn't mean that they cannot be used in a domestic environment just as well. In my experience, most 'near-field' monitors work fine in a small to medium sized living room. 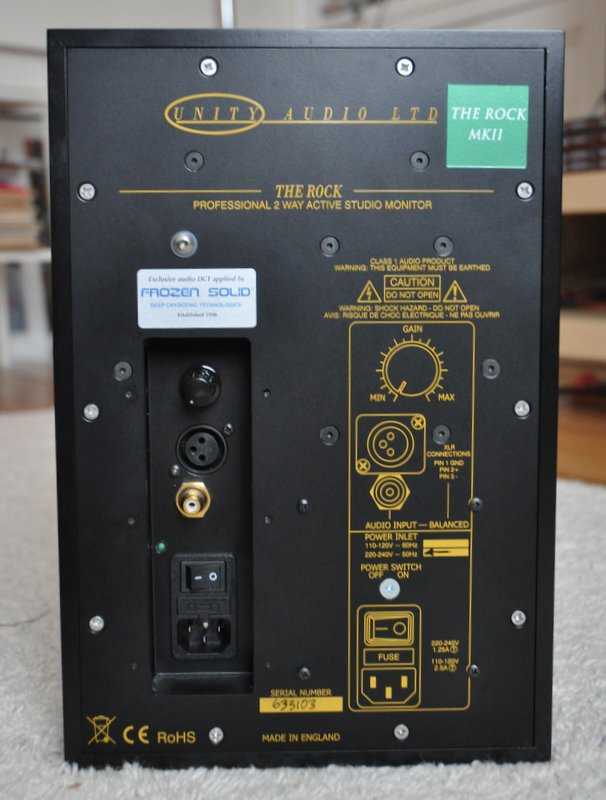 The drivers used in the Rock are sourced from Elac, who uses them in a domestic speaker anyway. The bass unit has a paper cone with an aluminium insert and measures 7 inch, or 175mm. The treble unit is an AMT (Air Motion Transformer) type driver, most famously made by Heil, whose version was reviewed here on TNT before. AMT tweeters are much more popular in the pro world than in domestic speakers, possibly because of their robustness. AMT's are often described as ribbon tweeters, but this is not completely correct. What they share with a real ribbon is that the component that conducts the current is also the part that actually moves the air. With dome and cone speakers there's always a separate voice coil and transferring the motion from one part to another adds mass and the possibility of distortion and break-up. As a true ribbon tweeter only has a single component doing both, it also has the potential to prevent these issues. But AMT tweeters are different. First, the conductor is attached to a backing, and secondly it is folded many times, in a concertina fashion. It is then suspended in a strong magnetic field such that half the folds will squeeze air in one direction and the other half in the other direction. This means that a small movement of the membrane can move a larger amount of air, hence the name. 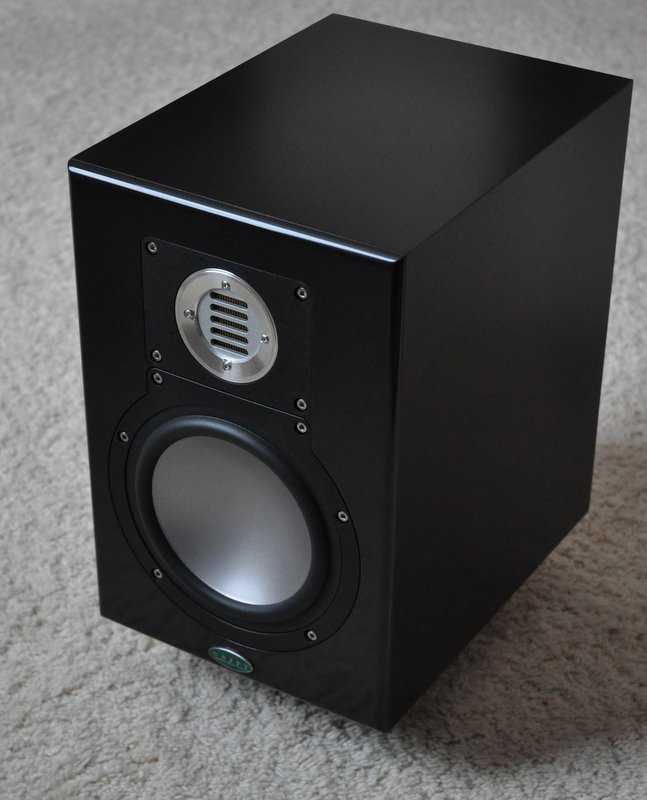 The Rocks are fully active speakers, with all the cross-overs and amplification built into the speaker cabinet. The back has balanced XLR and unbalanced phono input connectors and a sensitivity control. There are no bass and treble adjustments, nor any other filters. The cabinet is made from birch ply with a front from Corian, a material normally used for kitchen worktops, and an aluminium back. The cabinets are sealed, which should give tighter and deeper bass than the more usual ported design. A port is just a resonator, so will never be completely in phase with all of the signal, while a sealed design will not suffer from this, so should give cleaner and faster bass. The enclosure is said to be tuned to a Q of 0.6 - 0.7 and Unity Audio claim a -3dB point for the bass at 33Hz, which I consider somewhat optimistic, but I cannot measure these things myself so I'll have to go with their specifications. The amps used in the Rock are custom designed by valve amp legend Tim de Paravicini, of EAR Yoshino. They are solid state amps, but follow a valve amp design, with even the bass speaker transformer coupled to the amp. Unusually, the power supply only uses a single power rail. The bass amp is rated at 70 Watt and the tweeter amp at 30 Watt. The back panel of the speakers is actually a piece of 5mm aluminium, doubling as the heat sink for the amps. Even after considerable use, the back doesn’t really get more than slightly warm. 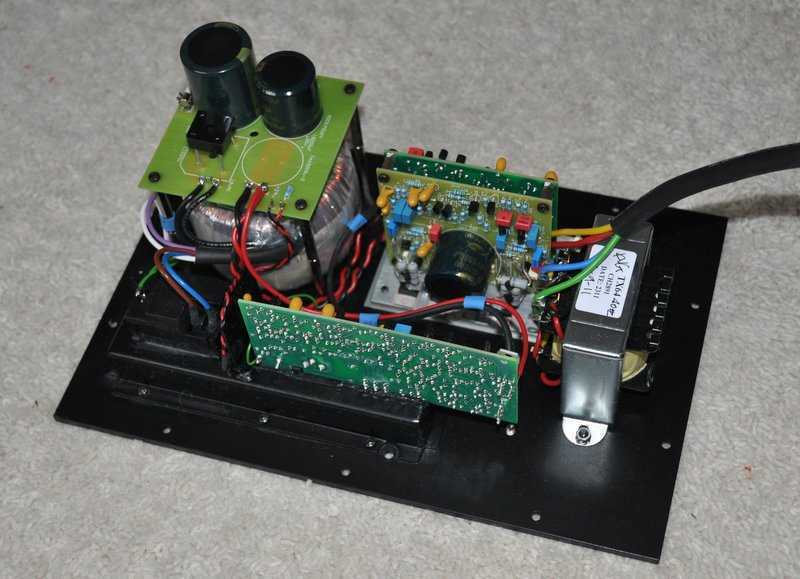 The inside shows that the crossover and the amps are all implemented without the use of opamps, but some of the components, especially in the power supply, look distinctly non-audiophile. The cable from the amps to the drivers, on the other hand, has had some cryogenic treatment. I used them with my Django transformer preamp and my Astin Trew AT3500+ CD player. I also used the new Oppo BDP-105 universal player, through the Django as well as direct, using the Oppo’s variable output. The Rocks are quite sensitive, which suits the Django, as it likes lower volume settings, but the Oppo was a bit less happy when used direct. It needed very low volume settings, around 20-30/100, which isn’t the best way to use the digital volume control, I feel. Luckily the Rocks have a sensitivity control at the back, which can take care of this. This is not a simple attenuator, but controls the gain of the input stage. Initially, I preferred to use the Django, even with the Oppo, but then I started experimenting with the sensitivity control and found that worked very well. I now got the best results driving them straight from the Oppo with the sensitivity turned back so that the Oppo's volume was always above 50. I also used the Rocks with a Burson Audio Conductor DAC/Preamp and a Townshend Allegri preamp which all worked very well indeed. One observation I made was that when you use the Rocks with phono connectors then there is some noticeable airflow through the now open XLR inputs. I put an unused XLR interconnect in them to fix this. The fact that I then thought that the bass was slightly more bouncy must be completely in my imagination, as I don’t think it will make a real difference. I kept the XLR interlink in anyway. Driving them through unbalanced phono cables from the Django, the sound is an immediate surprise: it is brighter than my own sE Munro Egg 150 speakers or other speakers I've had, but it is also very clear and articulate with strong and precise bass. It took me a little while to get used to the Rocks. Initially I thought they might be too bright, but my opinion quickly changed: soon I was thinking more along the lines of 'well lit'. The reason they get away with more treble energy than usual is the fact that the top end remains clean at all times, even at high volumes. It never, ever turns hard or aggressive so is much easier to take than with most other speakers. It must be that tweeter, although I suspect that the fact that they are active, and that the amps were designed by a valve man also has something to do with this. To my surprise, as I did initially find them a bit bright, I soon found myself just listening to the bass line for whole CDs on end, discovering new things all the time. This is where the sealed enclosure truly shines as these speakers really have phenomenal bass. The bottom end may feel somewhat dry if you are used to ported speakers, but it goes really deep and has plenty of drive and texture. The precision and resolution in the bass is simply amazing. It is worth optimising the distance to the back wall: they can be put quite close, but too close will result in boomy bass and a loss of soundstage depth. I used them on sand filled Partington Super Dreadnought stands with about 30-40cm of space between the speakers and the rear wall. Used like that, the Rocks are dryer than my own Munro Egg speakers, but they do not have the slight softness and blurriness in the bass that the Eggs suffer from. Very deep bass is actually stronger with the Rocks and the bass as a whole is much better timed. Pace and rhythm do benefit from this and the sound is fast and snappy, but not hurried. The overall picture is one of clarity and authority. The strange thing is that clarity usually applies to the higher frequencies, while authority happens in the bass, but with the Rocks the bass also has tremendous clarity while the top end is rock-solid and sits very confidently on top of that clear bass foundation. The whole presentation is very coherent and gives fantastic insight in both the recording as well as the performance. It even reached the point where it became difficult to judge other system components, like the CD player, as I found myself just listening to the music and the way the Rocks presented it. Compared to what these speakers can so, the difference between two decent CD players is somewhat less meaningful. Obviously, this is not to say that you cannot hear the difference between sources. You can hear quite subtle things actually, but for some reason they don't matter that much anymore. The Rocks were able to easily show the superiority of the Townshend Allegri preamp over my own Django, and also the difference between the Oppo player and my own Astin Trew. But even with the lesser of these components, the sound was still fine. Which is as it should be of course, because these are all excellent sources and preamps - some are just a little bit more excellent than others. Not precisely reviewer talk, I admit, but if the Rocks make me feel like this, then so be it. These speakers produce a bright, big and powerful picture, but they can also ruthlessly reveal the shortcomings in a recording. That is their purpose in life, after all, as studio monitors. While this can be unfortunate at times, it rarely is a real problem. The main reason for this is the clean treble which can easily expose a problem, but refuses to add to it. The strong bass also helps, being a joy with all sorts of recordings, good or bad. As always with active speakers, they have a way with dynamics that makes most passive systems sound a bit dull and blunted. And I don’t just mean that they can go loud, although they can. The main thing is the way they make things come alive and bring out the energy and enthusiasm in the music. I found myself playing complete CDs instead of single tracks, time and time again. Still, the really addictive property of these Rocks is the amazing clarity they bring to the party. Recordings you thought you knew well are laid out before you in a way that enables you to not just hear new elements, but to hear new meaning in the music. And the fact that this clarity extends all the way down to the bass is almost adding a new dimension to the sound. Bass lines are perfectly timed and much easier to follow, and the music simply hangs together much better because of this. The only area where my Eggs are superior, by a small margin, is sound staging. It must be the carefully designed egg shape that does it or otherwise the softer treble, but whatever the reason, the Eggs project a really good soundstage that is almost completely disconnected from the speakers and which feels very natural. In contrast, the Rocks still have a slight tendency to pull certain sounds towards the speakers, certainly with more problematic recordings. Both speakers are capable of producing rock-solid central images with decent depth and both are very good staging speakers, but the Eggs are simply exceptional in this respect. I also did a comparison with my Dynaudio Contour 1.8 mkII speakers, driven by the mighty Usher R1.5 power amp. This combination still sounds great, with a big, full bodied and warm sound that is very comfortable and satisfying to listen to. The total cost of these speakers and amp is also about the same as a pair of Rocks, making this an interesting test. Initially I was surprised by the amount of bass that the Dynaudios manage to produce, but I soon discovered that while a solo bass sounded good, the bass line got lost very quickly when more instruments joined in. In comparison the Rocks sound dryer and tighter, but bass lines are always clear and easy to hear. It takes some adjusting to the sound when switching between these two systems, with the Dynaudios sounding muddy and overbearing after listening to the Rocks, and the Rocks sounding dry and overly bright after exposure to the Dynaudios. But the ear soon gets used to the new balance, and I found the Rocks much more satisfying in the long run, even if the Dynaudios are easier to listen to and less demanding of recording quality. The Rock hifi has really impressed me. They are expensive, there's no denying that, but this is also the best speaker I've ever had in my system, by some margin. They are on the bright side and aren't always kind to bad recordings, but they do bring out so much life and energy that it is very easy to forgive them, even on those lesser recordings. Fantastic clarity, deep and articulated bass, great dynamic expression, perfect timing, these speakers are examples of the best that active speakers have to offer. They work wonderfully well in my living room and they are definitely a speaker to check out in this price range. They get my highest recommendation: I bought them myself. If you don’t want to end up buying a pair too, then I suggest you don’t audition them.